Creates a feature class containing lines that are generated by splitting input lines or polygon boundaries at their vertices. The attributes of the input features will be maintained in the output feature class. If an input line has no vertices between its start and end points, it will be copied to the output as it is; otherwise, every segment between two consecutive vertices will become a line feature in the output. Similarly, every segment between two consecutive vertices along a polygon boundary will become a line feature in the output. The output feature class can be a much larger file, depending on how many vertices the input features have. 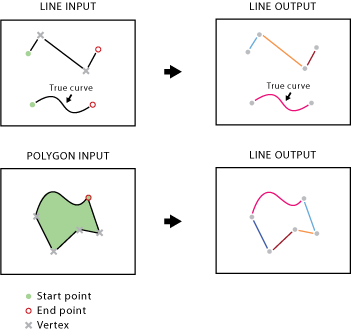 A parametric (true) curve line or segment will not be densified and will remain true curve as an output line feature. This does not apply to shapefile data. The function name of this tool in scripting is SplitLine, not SplitLineAtVertices. The input features that can be line or polygon. The following Python window script demonstrates how to use the SplitLine function in immediate mode. The following stand-alone script is a simple example of how to apply the SplitLine function in a scripting environment. #              and find a midpoint of each new line for further analysis. #           as an alternative label for each line between two bus stops.